Satisfied clients are any company’s best advertising. And when our clients tell us how happy they are with our work, we want to share it with everyone. 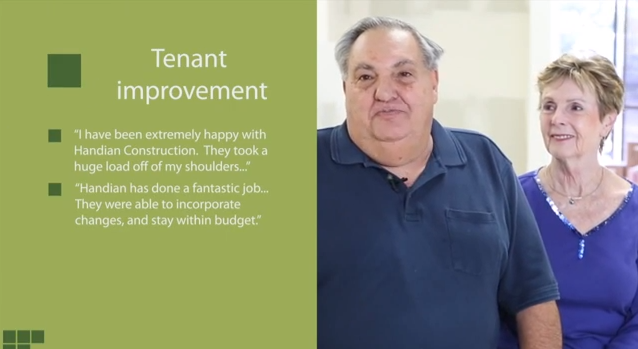 Click the video to the left to see and hear what our clients have to say about Handian or read the testimonials listed below. Handian helped construct our new restaurant, AMMATOLI Mediterranean Bites, in downtown Long Beach last year and it was a great success. Handian was professional throughout the process from the beginning of developing the engineering plans to getting the final permits. They were able to capture and implement our intended purpose and design for the restaurant which we had developed and executed it to perfection! Handian’s execution was seamless despite all the complexities and frustrations of a new construction and building a restaurant from scratch, as well as obtaining the permits and going through the numerous inspections. I felt very confident and comfortable working with Mark and his awesome team, they are true professionals, honest and they work with integrity. I must also mention that Handian’s honor to their warranty is unmatched, they are very responsive, and they respect maintaining a healthy and professional working relationship throughout the process. It’s been a little over 8 months now since we have completed the project and opened AMMATOLI, and I couldn’t be more grateful to had known Mark and his team. Thank you! I would recommend Handian Construction if you’re looking for somebody who is reliable and easy to get a hold of every time, and of course looking for someone help you build a beautiful restaurant!! Handian Construction was a great company to work with. Mark and his crew were very responsive and helpful in getting our permits passed. We couldn’t have done it without them! Mark knows his work. He and his team took great care of the project. We are 4 weeks into operations and the store is running great. I constantly walk about my store and admire how well Mark and his team did with bringing our vision from paper to reality. He truly is an expert and can be trusted to take care of your dream. Words can’t express the gratitude I have for Mark and the Handian Construction team. They worked with us on our first restaurant and made the process as smooth as possible (which we’ve learned is a difficult process in itself). From day one Mark has always been extremely responsive and put in 100% effort to answer every question, making us feel as if we were just as important as his larger projects. Chris is an amazing supervisor of Marks team, he went above and beyond to make sure we were satisfied with everything. Jose was extremely knowledgeable and trust worthy, going out of his way to ensure our inspections were passed to the best of his abilities. Jovig (sorry if I butchered your name) was extremely friendly and made us comfortable when he was available at the project site. All in all I would highly recommend Mark and his team, just as we were recommended to him. He does amazing work and will put his feet in your shoes to make sure you are within budget. Handian team was very professional. They built our second restaurant. We are very happy and grateful that we choose Mark and his team. After building our first restaurant with a different contractor that was very disappointing we were so scared to deal with another one but Mark changed our options on contractors. He is such a nice person and humble. Mark is on top off everything from dealing with the city, permits and all the hustle. He found some mistakes that our architects missed on the planes so we could change them before they start building it. They were very patient with us. Most important thing is that he gave us a time frame and it was very accurate. He cares,also he does dedicate a lot of time to his client. I takes pride in his work. 12 new restaurant,he is the best. It is extremely tough to find an honest straight forward person that cares about the outcome of their work. I reached Out to Mark after have talked to dozens of plumbers, electricians, contractors, city and county officials about a stalled project. Mark went out of his way to help me advance and finalize the store. He is very knowledgeable and knows what the city and county look for unlike other contractors that do not specialize in Restaurant build/ construction. Highly Recommended!!!!!! Thank you Mark! I call him Magic Mark! Not for his dancing skills but because he makes things happen -magically. From start to finish Magic Mark’s main goal is to take care of every aspect of your buildout so that you can focus on operating the business. With construction, there will be hurdles but Magic Mark takes care of all of it by working his magic. I did solicit several bids for our project and we ended up choosing Magic Mark for our buildout because he’s: 1) Easy going 2) ALWAYS available 3) Honest 4) Timely. Like all business owners, we were budget conscious but we feared going with the cheapest contractor who does shady work and having it end up wasting more money and time. We love that he is budget conscious and looks after our bottom line as well. Of course I have trust issues with every human being in my life, but when it came to working with Magic Mark, I learned to just trust him. He knows what he’s doing and he’s on your side. Our buildout finish fairly quickly around budget. We love our space and the opportunity to work with Magic Mark. Our next bakery, we’ll be bringing the same magic to the store. I currently own two restaurants. Restaurant 1 was done by another contractor who did a great job. Restaurant 2 was done by Mark. Why did I go to Mark for number 2? Simply because he had a vision and gets a feel for what you want. Don’t expect anything cheap. Quality service and work doesn’t come cheap. If you find a contractor that does cheap, chances are, you’ll have to end up spending more money. Mark and his team did a phenomenal job on my restaurant. From step 1 of getting permits to the finish line of getting everything signed off by the fire, health, and city. For my future restaurants, I will definitely be working with Mark and his team again. Mark built Lola’s Bixby Knolls for us and did an amazing job. Surpassing all of expectations! He has guaranteed all of his work and repaired anything we have asked of needed. Trust us he is a true professional and gets the job done so you can open your doors. Thanks again Mark! Mark and his team are wonderful to work with. Very responsive and cost conscious. Quality and attention to detail are always on point! Being a first time business owner building out a cafe can be very stressful. But Mark kept me informed and handled any questions or concerns with the utmost professionalism and speed. He genuinely cares about his customers and the quality of his work. And the fact that he can design and build your project is a HUGE timesaver!! No need to spend the time and money on an architect. He designed and built the first location of The Pie Bar in downtown Long Beach. I could not be more pleased!! I highly recommend Handian Construction! Mark is so awesome. Out of all the contractors we have had to deal with throughout this venture, Mark is the best one we have had the pleasure of working with. He’s organized, on time, on budget, hard-working, creative, and thoughtful. We’re so lucky to have him as our contractor and will continue to hire Mark for all our future build-outs and tenant improvements. Finally after 4 years we have found our awesome contractor! Mark Handian is a great dedicated contractor. I was a newbie inexperienced and he helped guide me through smoothly from start to finish the built out restaurant. He’s also there whenever we need after the job is done. 5 starts for customer service and professionalism. Being a first time business owner can be stressful because of all of the unknowns – design, tenant improvement, contractors, build-out etc. When we met Mark, right of the bat he was very easy to talk to. He thoroughly listened to all of our questions and concerns and worked with us to come up with the best and most feasible solutions. He was always pushing to meet deadlines, and pulling strings to get approvals. What I can’t stress enough is timing, it’s amazing how fast the process was without effecting the overall quality. Whenever we encountered a bump in the road, Mark would come up with a quick solution that was within our budget. He’s straightforward and reliable which is why we decided to continue working with him on our second location and possibly many more future locations. Thanks Mark for all that you have done for us! Mark’s expertise, hard work, and vision has truly made The Brass Lamp (the first book bar and lounge) the coolest place to hang out! His architectural and engineering background makes him a one-stop shop for all of your design and construction needs. The construction and development of my restaurant-bar was executed very well throughout every unexpected hurdle. Mark and his team are thorough, precise, and extremely creative. Handian Construction is solutions-driven, and works hard to keep costs down. Thank you Mark for your hard work and dedication in working on this project with me!!! You’ve built a beautiful bar for me and the downtown Long Beach community. Where to begin…!! There are so many things I could say about Mark Handian- great guy, there’s never a dull moment, very dedicated and hard-working, etc. but all you really need to know is that if you need a job done, he’s the guy you want on that job! He’ll make sure you’re taken care of. He won’t give up on you or your project. He’s got a great team! I’ve gotten to know Mark while he was working on The Brass Lamp (NOW OPEN!!) and I must say, it has been such a pleasure to work with him. We are very happy to finally be open, but we definitely miss having Mark around. Handian Construction is a pleasure to work with. They provide a straightforward estimate and are well educated in the permitting process and buildout. They have built out a couple restaurants in our market. Mark’s team worked meticulously and had everything completed in a timely fashion. They even kept the market spotless around the work site. I highly recommend Mark Handian to anyone and more importantly to all our new tenants. He’s gets the job done!! The completed project was truly beyond my expectations. It was a wonderful experience. Mark is no stranger to us! He’s done a great a job for us in the past and it was a no brainer that we brought him back to open our second location. Mark has great patience and spends time with his clients to understand what concept and feel that they want. He makes sure your happy with everything before he moves to the next step. If you’re looking for someone to do the work right and on time, he’s your guy. We are so glad to meet Mark Handian at Handiancorp. Mark is a great guy!!!! He came in to rescue us when we sank in the bottom of the ocean. Without Mark …..ETCetera Sushi & Izakaya in Costa Mesa won’t exist!! !